We are ideally located just east of the M60 in Trafford Park, five minutes from city centre Manchester, the Trafford Centre, Salford Quays and Media City. Design, print and copying of commercial office supplies and stationery. Special service for business cards, rubber stamps, NCR pads. Personalised stationery: design, print and copying for birthday parties and orders of service for weddings and funerals. 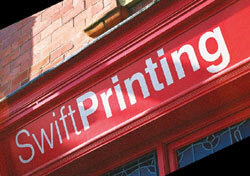 We are able to offer small print runs, with a speedy turnaround at highly competitive prices.